Hi guys! If you are getting that arctic blast right now, please be safe! We've been really lucky here with just a little rain and lows in the 20s. I'm going to be a blogging machine for the next couple days, so expect to be hearing a lot from me. Tonight I have the final Polish Pickup (PPU) shades for January's Famous Duos. 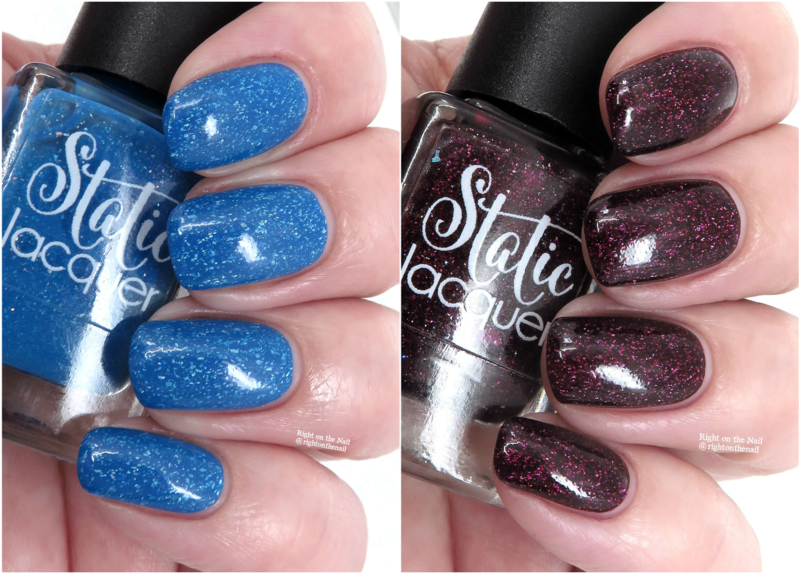 Static Lacquer stepped out and made 2 separate polishes for this month: one will be available in the PPU site, while the other will be available in the Static Lacquer website and will run concurrent to the PPU dates and times. PPU starts this Friday at 11:00 AM ET and will go through 11:59 PM ET Monday, February 4th. This month Stacy was inspired by Crowley and Castiel from the show Supernatural. OoOo, what a vampy shade we've got for this month. Lucky the Leprachaun is inspired by Crowley, the King of Hell on Supernatural. This one is burgundy jelly base with a scattered holo flake finish. Stacy is the queen of the holo flakes, so I was happy to see them represented not once, but twice this month! This one is dark, but not so dark you'll think it's black. It had a really nice formula, and needed just 2 coats for full opacity (which was a nice surprise since it's a jelly). It dried quickly with no texture at all. Up next is Feathers, which is inspired by Castiel, an angel to the Lord on Supernatural. It's a bright blue crelly base with holo microflakes and copper shimmer. This is a really happy shade and I've been wearing it for the past couple days. This one also needed just 2 coats, and dried with no texture. Despite being a bright blue, I had no issues with staining. These 2 polishes are really different, but I love them both! Supernatural has been on forever, and there is a huge fan base. If you are a fan of Sam and Dean, definitely pick these up. Don't forget, Lucky the Leprechaun will be sold in the PPU site, while Feathers will be available in the Static Lacquer site. You can learn more about Static Lacquer on their website, Facebook, Group, and Instagram pages, while you can find more about PPU on their Facebook page and website.